If you have an event like a celebration, birthday, beauty pageant, ect we can create a choreography for you to learn and work on polishing it. There is a $60 fee for creating the choreography and editing the music. We are committed to providing you with a friendly environment with constructive feedback, take home drills and exercises, and growth in your dancing that can be achieved through direct and purposeful learning. You can take private and group private classes (up to 4 people). These can be taken on their own, or in addition to weekly classes. 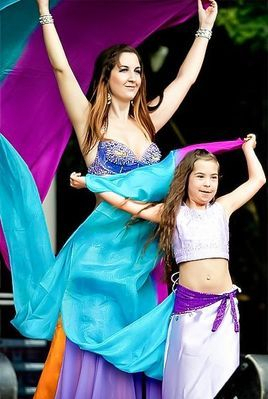 Your class can focus on a variety of topicscustom choreography, core belly dance technique, pre-show preparation, learning a particular skill, style or prop or to gain constructive feedback from a belly dance professional who can mentor you the basic movements, in improving your own style, and also your performance ability. Have another idea? Let us know and we can work out a package that suits you. If you are interested in private lessons with any of our teachers, please contact Candice directly and she can arrange times and discuss your goals with you. Please note: if studio rental is required, students will be responsible for any hireage fees. If you would like to join a regular weekly class, check out our classes page for more information.